This year's Friday reception sparked reconnections. 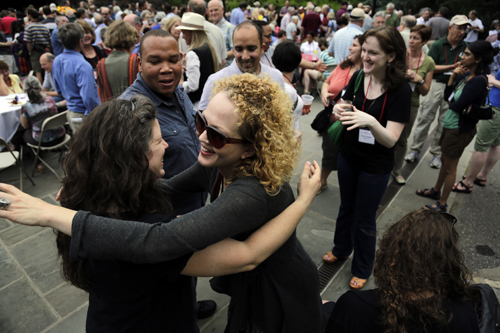 As always, Alumni Weekend was packed with music, panels, art exhibitions, and activities for reunioners of all ages—but mostly it was a time to reconnect with old friends, share stories and memories, and enjoy being together as a community. Alumni organized panels on such topics as “Trying to Help Others Across Cultural Divides,” “To Frack or Go Green: A Conversation,” and “The Second Wave of Feminism, or 40 Years in the Movement so that You Could Wear Those Shoes? !” An exhibit in the List Gallery displayed the works of six alumni, and an exhibit in McCabe Library featured the Vattel Volumes, donated to the College by Seth Many ’62. Music was well-represented during the weekend and included a 10th anniversary performance by alumni of Rhythm n Motion and the music of Robby George ’77 and Friends; The Kids; Dana Lyons ’82, Bart Robins ’82 and Rich Fields ’82; and a Saturday evening folk dance. Folk alumni celebrated Woody Guthrie’s appearance at the 1949 Swarthmore folk festival. 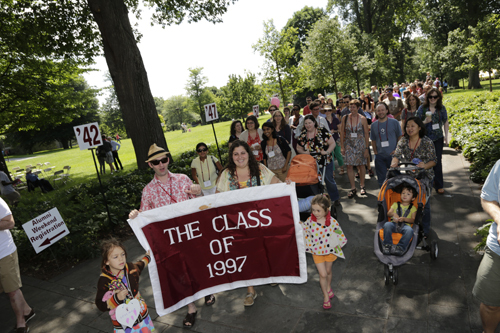 John Randolph '97 (left) and Jennifer Hayoun '97 carried the banner for their class during the Saturday morning parade. 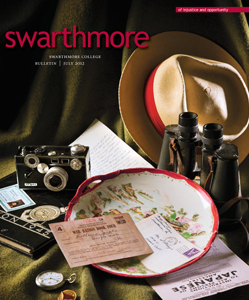 Attendees also could visit with Swarthmore faculty members over the weekend. On Friday evening, there were talks by Associate Professor of Political Science Ben Berger and Morris L. Clothier Professor of Physics Peter Collings; and Professor of Film and Media Studies Patricia White with Marshall Curry ’92 screened and discussed Curry’s Oscar-nominated documentary film If A Tree Falls: A Story of the Earth Liberation Movement. On Saturday afternoon, alumni visited with faculty members at departmental receptions. And, of course, there were class parties and gatherings and the traditional class dinners—all in all, an exhausting and exhilarating mix of events guaranteed a good time for all. Mark your calendars for Alumni Weekend 2013, scheduled for June 7-9.